Calls for lifting U.S. controls on energy exports are mounting as production nears a forty-five-year high. Rising production of U.S. shale gas and tight oil is sparking a debate about energy exports. But getting crude oil and natural gas out of the United States is complicated by regulatory, economic, environmental, and political concerns. Constraints on exports need to be relaxed, and costly infrastructure to liquefy natural gas and transport crude oil out of the United States must be expanded before exports can reach foreign buyers. Proponents of allowing U.S. oil and gas exports appear to be winning the argument, and some advocates predict significant impact on prices and international relations, especially by reducing reliance on Middle Eastern oil and freeing Europe from its dependence on Russian energy. Many experts, however, caution that while the United States will benefit from exports, the overall market and geopolitical effects will be less dramatic than expected. After decades of declining oil (and more recently gas) production and rising consumption, new drilling technology and better fuel efficiency have transformed the energy market in the United States. The country isn’t self-sufficient and will likely always need to import crude oil, but mismatches between the type of crude oil produced in the United States and that which can be optimally processed by domestic refineries, as well as a rising output of natural gas, signal the rise of energy exports. Natural gas is cheap and plentiful thanks to the exploitation of shale resources. The U.S. Energy Department is reviewing more than twenty applications for projects to liquefy the gas for export to countries that don’t have free trade agreements with the United States. Cheniere Energy spent billions to transform its Louisiana operation, originally designed as an import facility prior to the shale gas boom, into an export plant that plans to ship out its first batch of liquefied natural gas (LNG) in 2015. Other companies are slated to follow later this decade. Tight oil production hasn’t pushed U.S. supply above demand, but it has reversed the decades-long trend of dwindling output. 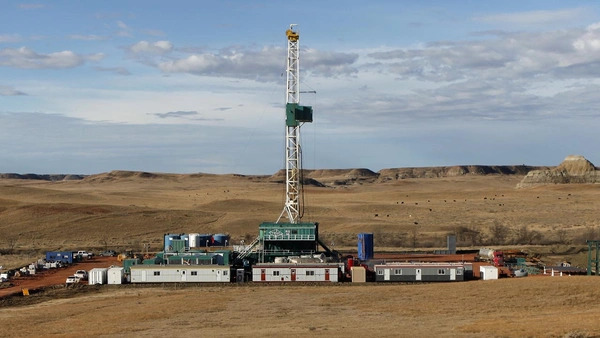 Oil produced from shale basins is expected to increase to 4.8 million barrels per day in 2021 compared to 900,000 barrels per day in 2009, according to the latest figures from the U.S. Energy Information Administration (EIA), which publishes an annual outlook on the sector. It predicts total oil production will peak at 9.9 million barrels per day this decade, the highest level in more than forty years. Forecasts of shale gas and tight oil have significantly underestimated future production, an error which the government agency admits. "There is considerable uncertainty about the expected peak level of tight oil production because exploration, appraisal, and development programs are expanding operator knowledge about producing reservoirs," the EIA says, noting that its current projections may end up being conservative. The United States has exported natural gas for almost a century, primarily through pipelines to Canada and Mexico, and also through a relatively small LNG plant in Alaska that operated from 1969 to 2012, according to the Congressional Research Service (CRS). Now the country is preparing for a larger role in the broader, fast-growing global LNG market. The first hurdle for exporters is obtaining federal approval. Trade agreements allow for some LNG exports, but U.S. government permits are required for many countries that are World Trade Organization (WTO) members. This requirement may become obsolete for European and Asian countries if the Transatlantic Trade and Investment Partnership and the Trans-Pacific Partnership are completed. Domestic consumers of natural gas, both individual and commercial, may also hinder exports if prices increase as supply falls. Concerns about damage to the environment from increased shale gas production can also stunt the growth of the U.S. LNG industry. Overall, the benefits of "allowing exports outweigh the costs of explicitly constraining them, provided that appropriate environmental protections are in place," writes CFR Senior Fellow Michael Levi in a 2012 paper. The U.S. government has approved large volumes of natural gas exports in recent years, and the EIA expects the country will become a net LNG exporter by 2016 and a net natural gas exporter in 2022. An influx of U.S. natural gas in global markets will have significant, if not immediate, consequences. An influx of U.S. natural gas in global markets will have significant, if not immediate, consequences. "If all the proposed U.S. LNG export projects were operational today, the United States would rank first in the world for global export capacity," the CRS says in a September 2013 report. Few experts, however, expect all the facilities will be built. Qatar is currently the largest LNG exporter, but Australia may surpass it by 2017. Global liquefication capacity is expected to rise significantly by 2020 which may foster more competitive pricing, providing an advantage for U.S. producers. But the long-term contracts and oil-linked pricing structures for current LNG agreements, as well as transport costs, will delay price convergence and the emergence of a global spot price for natural gas similar to the market-pricing mechanism for oil. Rising output of light tight oil (LTO) is helping the United States return to production levels it enjoyed more than four decades ago. Yet even under the most bullish assumptions, the United States will continue to consume six to eight million more barrels of petroleum and other liquids than its produces per day, according to the EIA’s twenty-five-year projections. This supply deficit appears to weaken arguments for oil exports, but the intricacies of U.S. oil infrastructure could lead to a surplus in light tight oil. U.S. refiners built plants to process heavy crudes from Canada and South America, and facilities that handle LTO are approaching capacity limits, forcing producers to offer discounts as volumes increase. A private equity investor with a stake in LTO properties in North Dakota, Texas, and Louisiana, is concerned about oversupply and may hold back on expanding production until it’s clear where the oil will be sold, and at what price. Many experts say this potential surplus of LTO and other liquids such as condensate should be exported. Increasing crude oil exports in any fashion will have positive economic effects both in the United States and the world. Oil export restrictions began in the 1970s when price controls on U.S. oil prompted domestic producers to seek more lucrative foreign markets. The 1973 Arab oil embargo, which led to widespread shortages in the United States, led Congress to pass the Energy Policy and Conservation Act of 1975, prohibiting the export of oil unless the president determined that certain exports are in the national interest. (A series of subsequent federal statutes regulating oil exports are detailed in this 2014 CRS report on crude oil export policy.) The debate over oil exports has settled around three policy options: maintaining the ban, relaxing or lifting restrictions, or allowing for temporary exports and redefining which types of crude oil are restricted. "I believe that the question of whether the United States should have a substantially more permissive policy with respect to the export of crude oil and with respect to the export of natural gas is easy. The answer is affirmative," former Treasury Secretary Lawrence Summers said in September 2014. His position is backed by a Brookings study that found "increasing crude oil exports in any fashion will have positive economic effects both in the United States and in the world oil market." The study predicts that U.S. gross domestic product will rise between $600 billion and $1.8 trillion if the ban is lifted, with the greatest benefits if exports are permitted in 2015. But some experts say these projections are overly optimistic and that export benefits will be more modest. In addition to charting the uncertain crude output from the United States, forecasting price effects hinges on predicting the behavior of the Organization of the Petroleum Exporting Countries (OPEC), the cartel that delivers almost thirty million barrels of oil per day to global markets. Saudi Arabia, OPEC’s most influential member and holder of the world’s largest spare production capacity, reduced its output in August 2014 as oil prices declined due to softer demand, especially in Asia. Increased supply of LTO and its potential export may further weaken demand for OPEC oil, but U.S. exports aren’t likely to pressure prices over the next few years. If prices fall or OPEC loses customers, some members may boost production and provide discounts, a development that would force U.S. producers to shut down due to the high cost of tight oil extraction. U.S. energy security and its ability to project power have been enhanced by the shale revolution, but predictions of the United States becoming a "Saudi America" are overblown. Pundits and officials have floated arguments that the United States can flood the market with oil or deliver LNG to Ukraine as a response to Russian pressure, but experts see these ideas as fanciful. Tangible benefits of increased energy production and potential exports are more limited. They include, in the short run, a reduction in the U.S. trade deficit, promotion of freer international trade policies, and the development of spare oil and gas capacity that can stabilize prices in the event of disruptions due to sanctions or conflicts. These benefits diminish in the long run. The sanctions on Iran, for example, which forced it to begin negotiations about its nuclear program, wouldn’t have been as successful without the gain in U.S. output that helped offset the loss of Tehran’s oil output. While oil is a significant factor for U.S. foreign policy, Levi says it’s important to ask "what has the United States tried to do and couldn’t do because of its oil-trade relationships" to gauge U.S. power. Energy exports from the United States won’t transform global markets, but they may have some effect on the margins. European countries squeezed by Russian energy policies can’t depend on U.S. exports. The European Union imports 24 percent of its natural gas from Russia—Germany sources 37 percent and Poland gets 59 percent of its gas from Russia, according to the Economist. Many countries have expanded storage facilities and built pipelines that can reverse the flow of gas, which helps reduce shortages, but finding alternatives to Russian gas will require an expansion of European gas exploration and more LNG imports. U.S. producers may choose to sell to European customers in the future if LNG prices are comparable to Asia, where they are higher. This commercial decision for both producers and consumers may keep many countries dependent on cheaper Russian gas and contend with the political cost. As the United States envisions a strategic "pivot" to Asia by reducing its attention on a Middle East mired in conflicts and focusing on the dynamic economies to the east, speculation has surfaced about a diminishing political and economic role for the oil-rich monarchies in the Persian Gulf. Bassam Fattouh, a professor at London’s School of Oriental and African Studies, says Middle Eastern countries are both the main suppliers of energy to Asia and of spare capacity for global oil, thus an influencer of prices. This role forces the United States to maintain alliances in the Middle East even if it becomes an energy exporter. This 2013 Congressional Research Service report examines the opportunities and potential outcomes of U.S. natural gas exports, while this 2014 CRS study explores U.S. crude oil export policy. The U.S. Energy Information Administration's annual International Energy Outlook 2014 provides an overview of current global oil markets and forecasts production and consumption over the next few decades. The Economist explores how Europe can reduce its dependence on Russian gas. Brookings highlights eight findings from its report on the economic opportunities of lifting the U.S. ban on oil exports. Test your knowledge of deforestation, from its role in climate change to efforts to combat it.